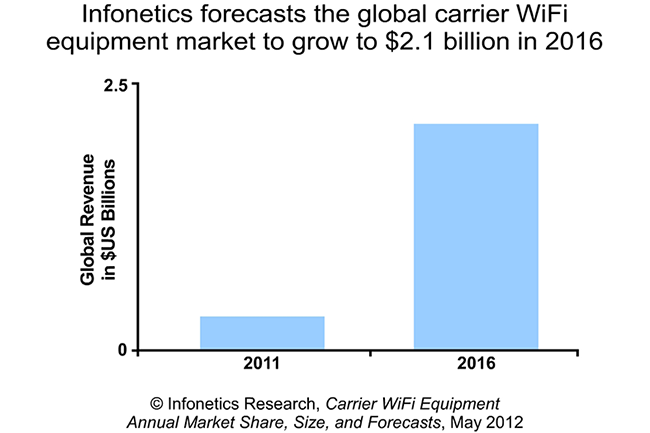 Market research firm Infonetics Research released excerpts from its new Carrier WiFi Equipment market share, market size, and forecast report, which tracks carrier-class mobile WiFi access points, carrier-class WiFi hotspot access points, WiFi hotspot controllers, and the vendors who manufacture them. Infonetics’ Carrier WiFi Equipment report is a new service that tracks the market for WiFi equipment deployed by operators in public spaces for wireless Internet access. The report covers carrier-class mobile WiFi access points, carrier-class WiFi hotspot access points, and WiFi hotspot controllers (not consumer WiFi CPE or enterprise wireless LAN equipment). The report provides market analysis, market trends, carrier WiFi equipment vendor market share, market size, and forecasts by revenue and units. The report also includes carrier WiFi vendor announcements and customer wins and a Mobile Operator WiFi Offload Strategies Tracker. Vendors tracked include 4ipnet, Airspan, Alcatel-Lucent, Alvarion, CeedTec, Cisco, Edgewater Wireless, Ericsson (BelAir Networks), Gemtek, GoNet, Handlink, HP, Huawei, Motorola, Nomadix, Proxim, RFNet, Ruckus Wireless, Shyam Networks, Strix Systems, Tranzeo, Tropos, Ubiquiti Networks, UniFi, Vivato, Wavion, and others. Contact Infonetics’ Sales to buy report: http://www.infonetics.com/contact.asp. Infonetics Research also released excerpts from its new Carrier WiFi Offload and Hotspot Strategies: Global Service Provider Survey today. 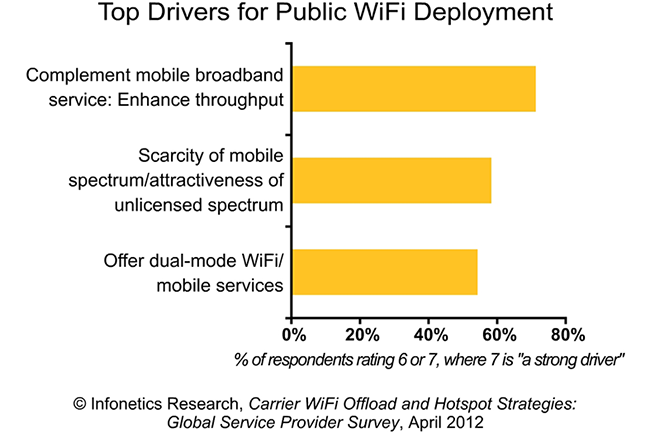 For its Carrier WiFi Offload and Hotspot Strategies survey, Infonetics interviewed 24 mobile, incumbent, and competitive operators in Asia Pacific, Europe, North America, the Middle East and Africa that operate a public WiFi network used for offloading cellular networks, or who plan to by year-end. The study provides insight into service provider WiFi offload deployment plans and drivers, ratings of WiFi product features, and mobile offload and WiFi service strategies. Together the survey respondents represent 35% of the world’s telecom carrier revenue and 36% of the world’s telecom capex (capital expenditures). Contact Infonetics’ Sales to buy report: http://www.infonetics.com/contact.asp.